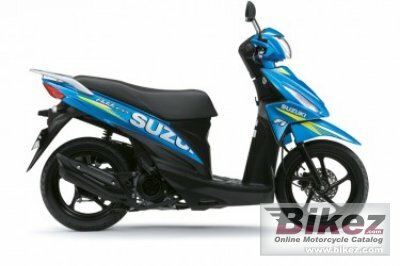 2016 Suzuki Address 110 MotoGP. Picture credits - Suzuki. Submit more pictures. Stash your full face helmet, rain gear and other items in the roomy 20.6 litre utility compartment, generously designed for extra spaciousness and convenience. There�s also even more space from the left and right storage compartments located below the ignition barrel with covered key functionality layout above the right pocket. Ask questions Join the 16 Suzuki Address 110 MotoGP discussion group or the general Suzuki discussion group. Bikez has reestablished Bikez.info motorcycle web shop overview. Here we present the major online shopping possibilities for motorcycle parts, gear and accessories. This includes customizing and insurance. Search and compare products and prices. Try our 2016 Suzuki Address 110 MotoGP discussion forum if you have questions or comments. Information about any technical issue is always welcome.